Could you explain the benefits of the three different picks list? Predefined, automatic and my picks? What is the difference between an automatic pick and a favorite? Thanks. Tracy, there is only one pick list, however items in pick list may have different origin. “Predefined” products are records coming with the app. 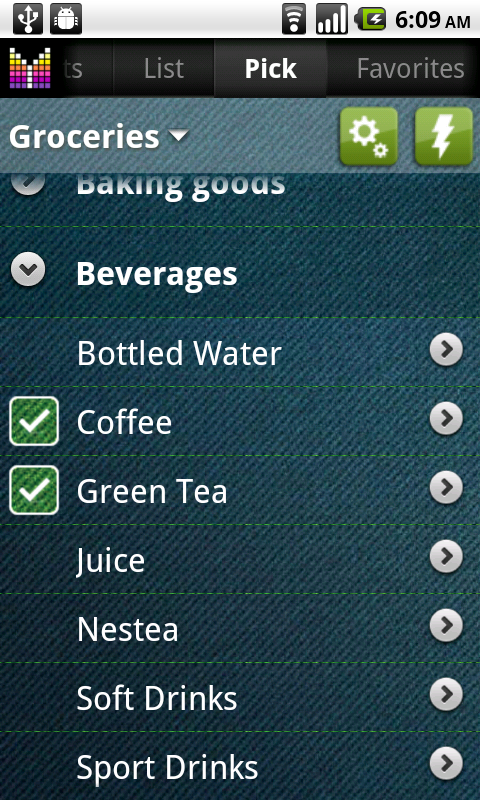 “Automatic” are products created in your pick list as you add items in your shopping list and then checkout. “My picks” are records you can add yourself. Favorites are similar to “My picks”, but the Favorites list is only limited to items created manually and does not include neither Predefined nor Automatic products. Please see Configure Pick list and Favorites for more details. I am new to this app. How do I add items that are not on the ADD list? I want to add specific spices or specific drinks or meats that are not listed on the selections list for example. Otherwise I am enjoying using and exploring this app. Linda, you can items to the search list (Add list) under Menu –> Settings –> Pick list –> My picks. Also, all items from your History will appear on lookup list. Please let me know if you have any further questions or comments. I am looking for a way to get one item on more than one list. There are items that are shopped for at more than one store. For example, I have my grocery store and I have my super store where I sometimes shop for groceries and other items. I have currently have a master grocery list with my grocery and super store as sub lists. My delima is two fold. 1) How do I add tuna to both my grocery and super store so that I may pull that specific list (which enables the aisle view) it will show on both lists and remove it from both lists upon checkout? 2) How do I add misc. items to my super store list which is a sublist of my master grocery list but not have the items appear under groceries? Other than these two questions, I LOVE the app! Thank you. Hi Diana, thanks for your feedback and your question. I’d recommend creating three lists for your case (you can give any names you’d like): 1) Master list; 2) Grocery; 3) Superstore. If you’d like to buy something in a specific store, just assign it to Grocery or Superstore. If you’d like to buy an item from any of your stores, assign item to the Master list. Hopefully this makes sense. Please let me know if you need any further assistance. I’ve been enjoying using Mighty Grocery. Here’s a pick list suggestion. I have a large pick list for the grocery store, grouped by aisle. Sometimes I scan the store-specifc pick list and don’t find the item I want right away, so I immediately think of using the search function . But I can’t search the pick list–hitting the search button does nothing. I have to switch over to the “List” and search there, which takes extra work. How about enabling the search function when viewing the pick list? It should of course work the same as when viewing the shopping list (meaning it only searches the items in the aisles that are active for the selected store). Thanks! Hi Geoff, thanks for your feedback and suggestion. Searching in Pick list sounds like a useful feature. We will consider adding it in the future. found where aisles is located, however, when i go back to my grocery list, i dont no how to get that to show aisles. so problem is, when i’m in my list, how do i get it to show aisles? Judy, to have your items grouped by aisles, please have a look at this suggestion. While this serves a purpose, it also makes it pretty cumbersome to add items from the various pick lists when you are making up shopping lists. Currently, the only pick list that shows up in the tabs at all times is “Picks” which is the predifined catalog. Within that list, I can select one of the others, and it temporarily shows up as a tab, but the next time I open the app, the tab is gone. This is very inconvenient. Also it is incovenient to have to remember which of the various lists an item is in. My suggestion: Instead of having three (3) seperate pick lists, why not just have one (1) “universal” pick list and allow users to filter what items show up in it? The data can still be kept in three seperate lists as it is currently, but users can choose whether to have one, two or all three data sets show in their single “pick list”. You can just have an easily accessbile “filter list by” setting. This would eliminate the need for temporary tabs to show up, and/or for users to have to go into settings EVERY TIME they want to use a list other than the predefined items list. This would make things SO much easier. Please consider adding this functionality. Jarrett, actually there is only one Pick list. Under the Pick list tab all three “sub-pick lists” are merged. We had to add these sub-sections in settings to allow advanced manipulations with product catalog in Pick list. Somehow I missed this…..bear with me, I am new at your app and there is alot of functionality to learn. So if I understand correctly, the app already functions in basically the way I was suggesting. Well, pretty much. We don’t have “filter by pick list” setting which would allow adding items to shopping list. Other then this, the current implementation looks the way you were suggesting. Would it be possible to have the value of picked items show in the pick list as this would save having to keep switching to shopping list to see the value of items picked. Hi Keith, thank you for your suggestion. We may consider adding this feature if we see more users interested in such improvement. Thanks and I look forward to hearing from your again. I wholeheartedly agree with Keith’s excellent suggestion. May I suggest that the Picks function provide the ability to add new items directly to a store’s pick list? This would facilitate planning a shopping trip before getting to the store particularly if the new item may be bought in future trips. I have tried to get it there by adding it to the List and then checking out the new item but it did not show up in the Pick list even after using the option to “Add existing products from history, etc”. It told me that “All items are already on the Pick list”. I also tried adding it to the Favorites for the store but it still did not get into the Pick list even though the “Show in Pick list and Search” box was checked. By playing around I finally got it into the Pick list but, as of this writing, I cannot remember the scenario that worked. Sorry, I know this does not help you! I am also confused by the details of the items on a store’s Pick list. Some items show the store’s name in the Shopping List but other items say “Any List”. Would appreciate a clarification. May I also suggest that the Pick lists be pushed to the cloud with the add item capability? This is for the same reasons noted above. Currently, the List is pushed but is empty after checkout. Hi Prakash, thanks again for your inquiry. Kindly note that it is possible to add items directly to Pick list in Menu –> Settings –> Pick list –> My picks. Otherwise, the item will exist on Pick list if there is a corresponding record in shopping list or in History. As to “Any list”, for products in Pick list, “Any list” is displayed as “Shopping list” value which means that this product may be added to any list. Specific list is shown for shopping list items. As for syncing Pick list with cloud, we consider adding this feature in the future. Please let me know if you have any further comments. I forgot to mention in my original post that I had already tried the My Picks option you suggested. While trying this, however, even though I had selected a specific store, the item got added into Any List and DID NOT show up in that store’s Pick List even after using the option to “Add existing products from history, etc”. It told me that “All items are already on the Pick List”. Also, when adding a item to a store’s Favorites, the item gets added to the bottom of the list and not under the aisle specified for the new item. Assuming that the Favorites list for the store had to be “refreshed” for the item to show up in the correct aisle, I went to other options and then back to the Favorites but the item was still at the bottom. Must have done something wrong but don’t know what! Anyway, on a positive note, after a lot of playing around, I have now gotten my Mighty Grocer to do exactly what I want which is to create a shopping List for a store from the Pick List for the store. And, if an item is not on the Pick List, I add it to the shopping List and it also gets added to the Pick List. I have basically done away with using the Favorites lists since these were duplicates of the Pick lists. So none of my stores have List-Specific Favorites and, just to be on the safe side and eliminate any confusion, I deleted all the items from Favorites. Now the drop-down box for Pick Lists just shows my stores (the * store-name is gone) though there is still a * Favorites which doesn’t really hurt anything since it is empty. I also learned that an item cannot be correctly added to a shopping List for a store if the same item exists in another store’s Pick List. So I just changed the name a little (“OldSpice Deodorant” versus “Old Spice Deodorant”) and it worked fine! I now love Mighty Grocer all over again! Thanks for listening to this long-winded post. Hi Prakash, thanks so much for your feedback and sharing your experience with other users. I am glad you could make Mighty Grocery work for you. Just wondering how I can put the information in how much I want to buy. ( maybe 4 bottles of wine or 2 apples) Is that possible? How? Hi Stephanie, thanks for your question. Yes, it is possible to set quantity for items in Mighty Grocery. Please see Edit item details User’s Guide for more details. Oh , good! I didnt see that function. Most of the barcode I am looking for are not found inthe database Mighty grocery uses. (I am looking for German products usually) would it be possible maybe to use an open database where they are already in ( maybe http://codecheck.kaufkauf.net/ )? That would be great! Stephanie, thank you for the link. We will consider integrating with other barcode databases such as kaufkauf later this year. Thanks again! Hi Doug, thank you for your question. Kindly note that item will be listed under Kroger store only if it is assigned to Kroger store, not the Master list. 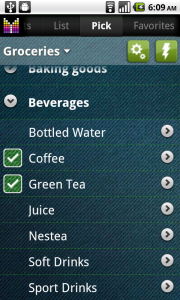 Please see Edit item details User’s Guide on how to move item to a different shopping list. The other option is to scan your items directly into Kroger shopping list. As to your question, though it is possible to create Kroger-specific Pick list through customized aisles and Kroger-only aisle, it is not recommended due to complexity of setup. You may want to consider List-specific favorites for your Kroger list.